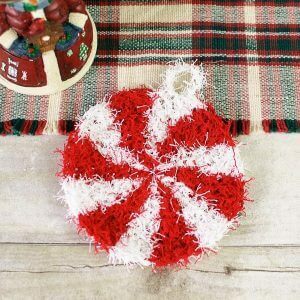 This Christmas Peppermint crochet scrubby pattern is so much fun to work up and will definitely add a little festive cheer to your holiday cleanup! Pair it with a pretty tea towel and some specialty dish soap and you’ll have a heartfelt (and helpful!) gift for your hosts. Be sure to also check out these ornament and star scrubby patterns I designed and make a whole holiday assortment! 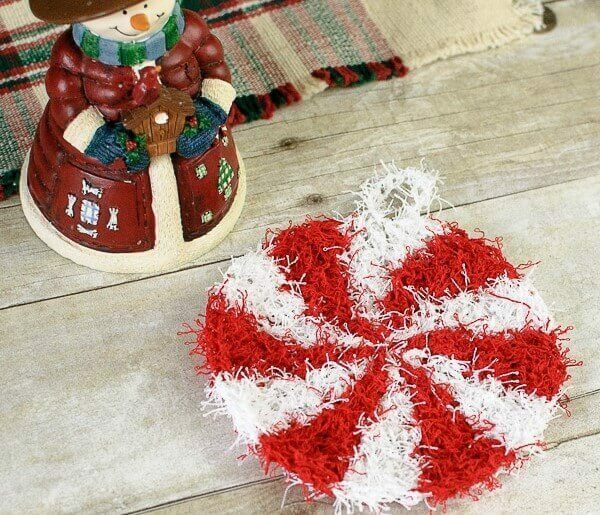 Finished Christmas Peppermint Crochet Scrubby Pattern measures approximately 5.5 in. in diameter. Note: For seamless color changes, introduce the new color on the last yarn over of the stitch before the one you want the new color shown. Put another way, the new color is introduced on the final yarn over of the stitch before. If you need a more visual example of color changes, see this photo tutorial How to Seamlessly Change Colors in Crochet. 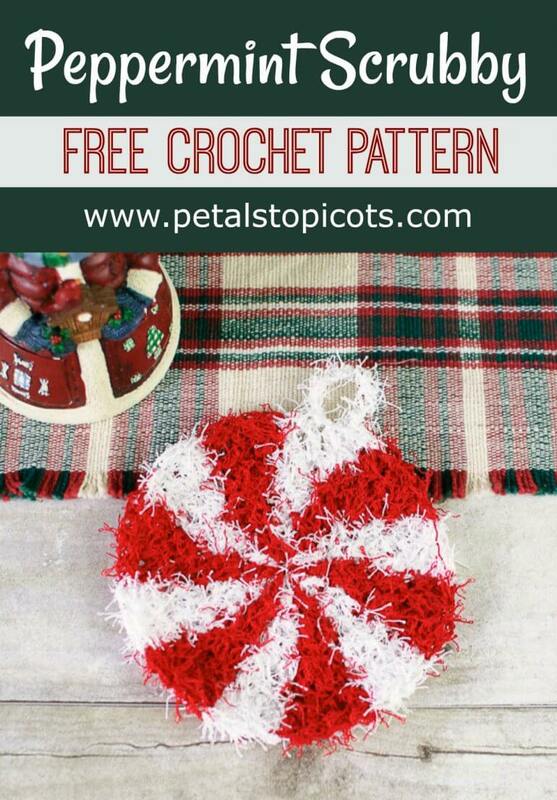 You can also refer to the Peppermint Candies Christmas Pattern which includes step by step photos of how Round 1 here is worked. Round 2: With white ch 3 (counts as dc here and throughout), work 1 dc in same st as join, with red work 2 dc in next, *with white work 2 dc in next, with red work 2 dc in next, repeat from * around, join — 24 sts. Round 3: With white ch 3, work 1 dc in same st as join, 1 dc in next, with red work 2 dc in next, 1 dc in next *with white work 2 dc in next, 1 dc in next, with red work 2 dc in next, 1 dc in next, repeat from * around, join — 36 sts. Round 4: With white ch 3, work 1 dc in same st as join, 1 dc in each of the next 2 sts, with red work 2 dc in next, 1 dc in each of the next 2 sts *with white work 2 dc in next, 1 dc in each of the next 2 sts, with red work 2 dc in next, 1 dc in each of the next 2 sts, repeat from * around, join — 48 sts. Making the hanging loop: With white, ch 10, Sl st in next st.